Starting out with Bees is for anyone beginning to explore beekeeping as well as for new beekeepers who may already have started. The focus of this book is on the practical aspects of beekeeping and what beekeepers need to do month by month when starting out with bees. A brief description of the honey bee colony includes the function of the queen, worker and drones. There is a summary of the requirements for an apiary site, a description of the pros and cons of some of the equipment choices to be made as well as a comprehensive list of equipment needed to make a start. 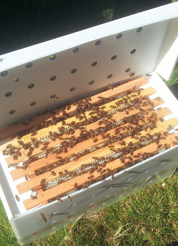 The month by month accounts start with August, the beginning of the beekeeping year. For each month, a description of what the bees are likely to be doing in the colony is followed by the beekeeping tasks that will help, linking the work of the beekeeper to the needs of the bees. Bee health matters include an introduction to disabilities and diseases with pictures and guidance about when to seek advice from more experienced beekeepers or bee health inspectors. 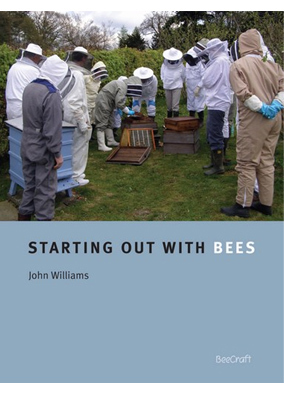 This book will help the new beekeeper with all the basic beekeeping procedures for the first few years including marking the queen, making up a nucleus and selective queen rearing. It also includes information on preparing clear and soft set honey, making mead and beeswax candles.